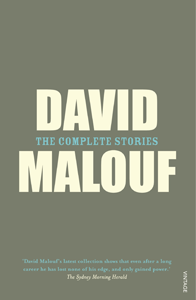 Thirty-one epic stories from Australia’s award-winning author David Malouf. David Malouf’s imagination inhabits shocking violence, quick humor, appealing warmth and harsh cruelty with equal intensity. He shares tales of bookish boys, taciturn men and intimate stories of men and women looking for something they seem to have missed, or missed out on. This is a comprehensive compilation of David’s shorter work. Stories are set in the stark and challenging Australian interior and the more lush and mysterious coastal enclaves; others are set in Australia’s past. The youthful dreams, physical desires and mental despair of Malouf’s richly varied characters as they explore their place in the world are always moving and universal. Readers won’t want to skim a single page of the 31 stories in this epic collection, a few of which are novella length. Together, they represent a quarter-century of a formidable craftsman’s career. David Malouf is the internationally acclaimed author of novels including The Great World (winner of the Commonwealth Writers’ prize and the Prix Femina Etranger), Remembering Babylon (shortlisted for the Booker Prize and winner of the IMPAC Dublin Literary Award), An Imaginary Life, Conversations at Curlow Creek, Dream Stuff (‘These stories are pearls’ Spectator), Every Move You Make (‘Rare and luminous talent’ Guardian), his autobiographical classic 12 Edmondstone Street and Ransom. His Collected Stories won the 2008 Australia–Asia Literary Award. In 2008 Malouf was the Scottish Arts’ Council Muriel Spark International Fellow. In 2016, he won the Australia Council Award for Lifetime Achievement in Literature. He was born in 1934 and was brought up in Brisbane. An ASA Council Member on why this book is in the Reading Australia First 200 list.